When I picked up our produce box last week, I spotted a bag of stir-fry mix and a small bunch of green garlic sitting in the "share pile" where other CSA members leave things from the box they know they won't use for others to take. 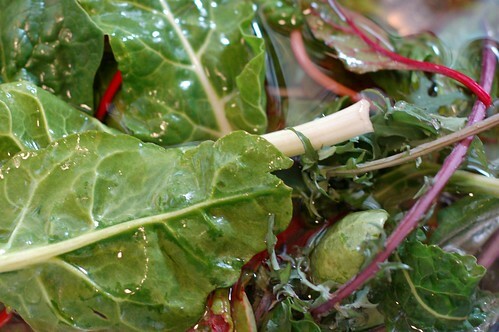 The stir-fry mix includes two kinds of baby kale, baby chard, some collard or mustard greens, and spinach. The green garlic is what you get when you yank up garlic at this time of year--instead of a head of garlic you get a garlic-y tasting baby leek-like thing. I snatched both things up immediately and added them to our box of goodies. But it was not until I got a hankering for Asian-style food that I decided what to do with them -- then it all fell into place quite nicely. We stir-fried the greens and green garlic along with some carrots and onion, as well as a generous dose of regular garlic and ginger for added flavor. I wanted some protein so we added some shrimp (apparently of the eco-friendly variety) to the mix though I decided to stir-fry them separately to avoid any sogginess or overcooking. I flavored the greens with a mixture of rice mirin, black soy sauce and oyster sauce and sprinkled everything liberally with chopped fresh cilantro. It was really delicious, if I do say so myself! * Prep all your ingredients ahead of time. Once you get the wok fired up, you really won't have time to do anything besides add things and keep them moving around to ensure even cooking so it's important to cut everything up, prepare your sauce, and have it all close by and easy to grab before you begin frying. * Slice mindfully. Since stir-frying uses very high heat to cook food quickly, it is essential that you slice things thinly enough to allow for this quick cooking time. It's also important to cut different foods into the correct sizes to ensure equal cooking time. For example, carrots and onions need to be sliced thinly while snowpeas probably don't need to be cut at all. * Pay attention to the order of operations. It's crucial to add things to the wok in the order of the amount of cooking time needed. 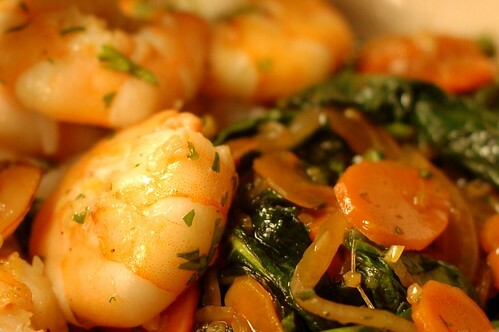 Things (like spinach or other greens) that will cook quickly should be added later in the process than veggies like carrots. * Start with the "aromatics." Begin by frying the garlic, ginger and chili peppers in oil briefly--not long enough for the garlic to burn but just long enough so that all three of these delicious ingredients have time to release their oils into the oil, flavoring it for all the ingredients to come. * Don't forget the cornstarch. I remember making a number of really soupy stir-fries in college. To be honest, they were kind of gross. But simply adding a teaspoon or two of cornstarch to your sauce will prevent you from creating a "wok bog." The cornstarch will thicken all the liquids in the dish, leaving you with a stir-fry that is nicely coated in sauce but not swimming in liquid. Okay, enough notes! On to the recipe. 1. Start the rice. Since it will take a little while to cook, you should start it well before you get into any stir-frying to ensure that everything will be ready to eat at the same time. 2. Prep all your ingredients. Once everything is washed and chopped, make the sauce by mixing together the soy sauce, rice mirin, oyster sauce and cornstarch and stirring well to combine. By the time you've finished doing all that chopping and mixing, it's likely the rice will be done. Fluff the rice and remove from the heat. 3. Prepare the shrimp. Heat 1-2 Tbsps of the peanut oil in a wok over high heat and swirl to coat the wok's sides. Add roughly one quarter of the minced garlic and ginger you've prepared (the rest will be used for the greens) and a pinch of the chili flakes to the oil and stir-fry for 30-45 seconds. Toss in the shrimps and stir until they are cooked through (they should turn pink) --about 3-4 minutes depending on the strength of the flame you're using. Turn the wok off, scoop the shrimp into a bowl, sprinkle with a few grinds of white pepper and a pinch of sea salt and set aside. 4. Prepare the greens. Wipe the wok out with a paper towel to prevent everything you're about to cook from tasting like seafood. Turn the heat back on high and pour another few Tbsps of peanut oil into the wok. Swirl to coat the wok's sides evenly with the oil. 5. Toss the remaining three quarters of the garlic and ginger into the oil, along with another pinch of chili flakes and stir-fry for 30-45 seconds to flavor the oil, stirring to prevent the garlic from sticking or burning. 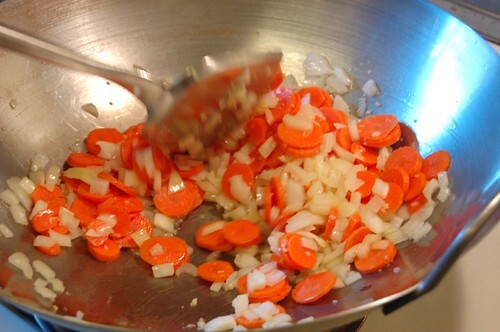 Add the sliced onion, green garlic and carrots and stir for 3-5 minutes or until beginning to soften. 6. Pour in the greens and stir to ensure that they get coated with oil and come into contact with the wok's searing hot sides. Stir-fry until they are wilted and softened to a point you like--some people prefer them more raw than cooked and others prefer them really cooked. Regardless, it is truly amazing how much the greens cook down in just a few minutes. 7. Pour in the sauce and stir well to ensure that it coats all the veggies. Turn off the heat and remove the stir-fried veggies to a bowl or plate (sitting in a wok after cooking can turn food black as the metal oxidizes.) 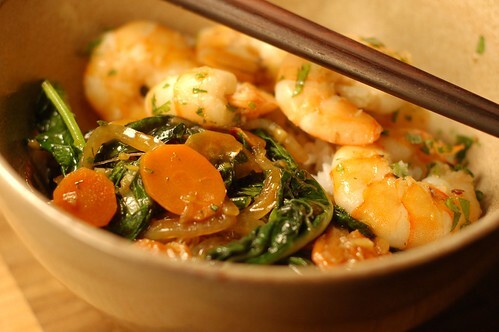 Serve the stir-fried greens/veggies and shrimp over rice, sprinkled liberally with the chopped cilantro. Like this recipe? Click here to browse through more Eatwell Recipes. Your photos are amazing! I can't believe someone would leave their greens behind - what a score for you! I love green garlic, and have been cooking with it nonstop since I spotted them at the Berkeley markets. Last night I made a pesto with lightly sauteed green garlic, sun-dried tomatoes and walnuts. I served it with roasted cauliflower and wild rice - so good! I absolutely want to give this recipe a spin - it has all my favorite ingredients. Thanks for your post, I am a huge fan of your blog! Yeah! Another EatWell recipe! Kudos on great photos, make it that much more enticing! Thank you all for your delightful comments! Thank you but 1 question, where does the cornstarch come in? Do you add it when you add the sauce? Thank you and where does the cornstarch come into play? Do you add it when you add the sauce? Hi Nikki, yes when you add the sauce. Sorry, will fix.